Every now and then a reference book comes along that deserves to be included with such greats as the Badge books by King & Kipling and British Battles & Medals. This book follows on from Swords of the British Army by Robson and deserves to be included with these outstanding publications. 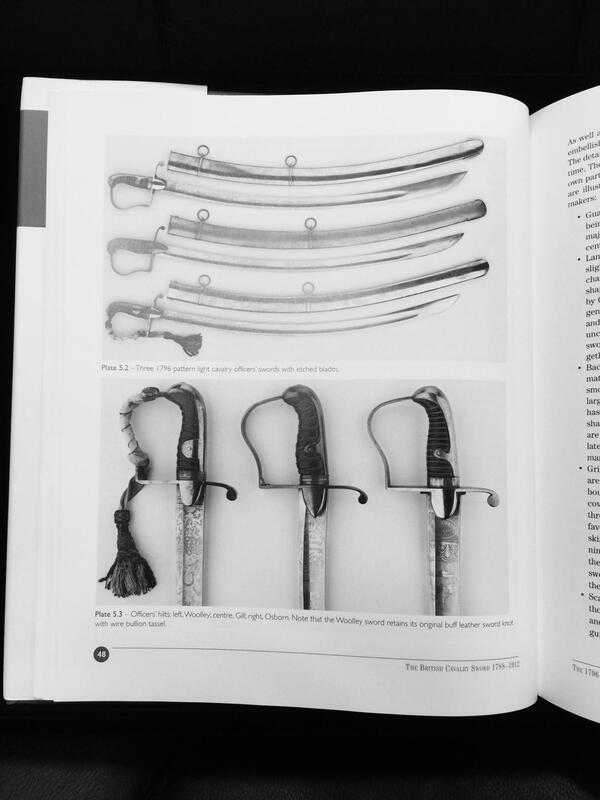 Specialising in Cavalry, Dellar expands on each of the patterns in a clear and concise manner and I feel sure it is a book that will negate the frustration of a google search for information. Hard cover, sewn section, gold blocked with a dust jacket 326 pages. This book is profusely illustrated on quality paper giving numerous examples of the various patterns. A must have for any serious sword collector. An absolutely outstanding 1814 Household Cavalry Officers sword which I doubt could be found in better condition. Absolutely true to pattern retaining almost it’s entire gilt with superb fish skin grip. Complete with period sword knot. For an example of a reasonable condition 1814 see DNW Auction December 2006 where one sold for 9800 pounds (Incl. BP) which was nowhere near the quality or condition of this sword. An outstanding pair of 1796 patter HEAVY CAVALRY swords which have stayed together for over 200 years. 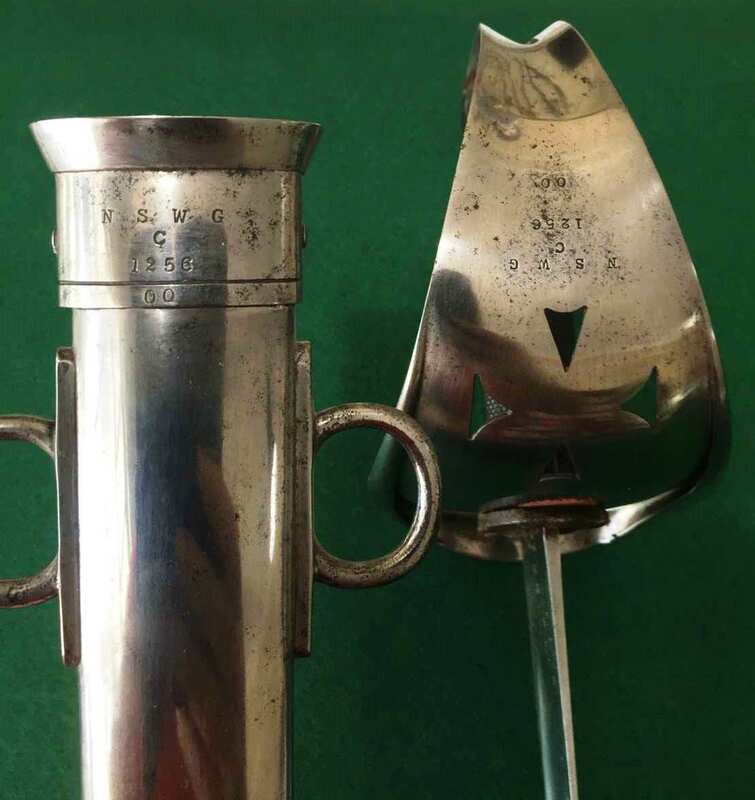 Both have “FERARA” blades which would suggest the Officer has approached the sword cutler requesting he build the current 1796 dress regulations around the two family blades. R.JOHNSTON late BLAND & FOSTER 68 St. James St. London in the cartouche. Only to be sold as a pair. An extremely rare and unusual 1796 Heavy Cavalry Full dress Sword by Irish maker J. Read maker 8 College Green Dublin in cartouche on top scabbard mount. Apart from decorative stirrup hilt the sword is true to pattern except for the scabbard which is very fancy. Top scabbard ring appears to be period removed possibly to allow easier vertical hanging. Top mount has engraved crown over Prince of Wales plumes and there are various other motives on the scabbard mounts. The scabbard has reasonable repairs due to the age old problem of people withdrawing the blade from the horizontal. 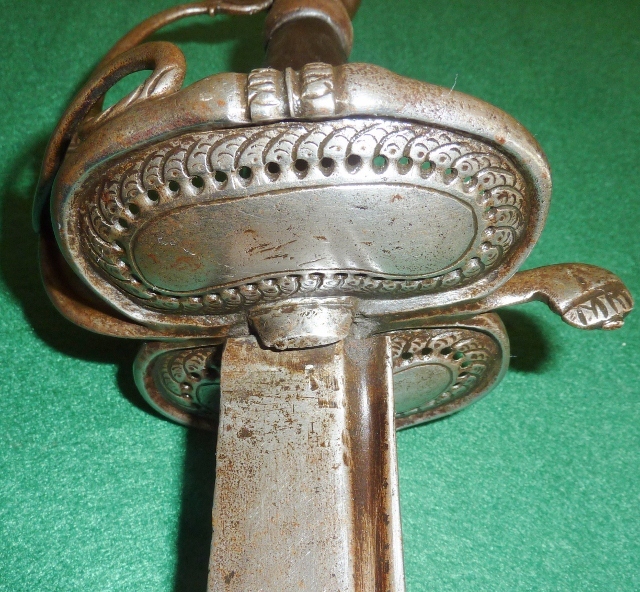 A rare variation of the 1796 Pattern Heavy Cavalry Officers sword. 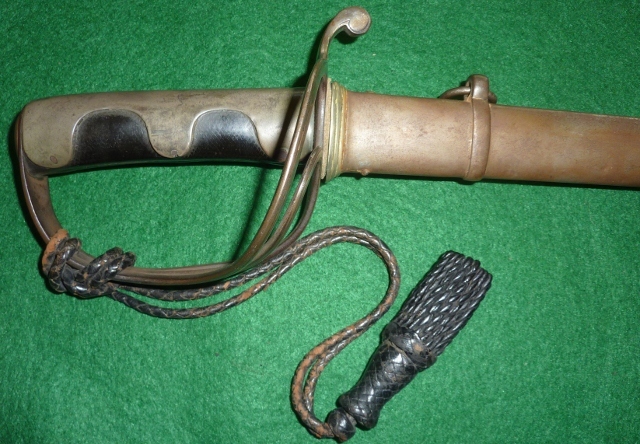 85.5 cm pipe back clipped point blade with excellent wire bound leather grip and typical steel ladder hilt with elongated pommel. All steel scabbard with two quite well repaired dings (one on each side). For a similar blade see Bonhams sale Lot 116 11th December 2007 which sold for S4357. A scarce 1796 Pattern Troopers Heavy Cavalry DISC HILT Sword. True to pattern in all respects still retaining its langets and hatchet point . A good heavy scabbard which is dent free and marked C over 17 with matching marks on the hilt. 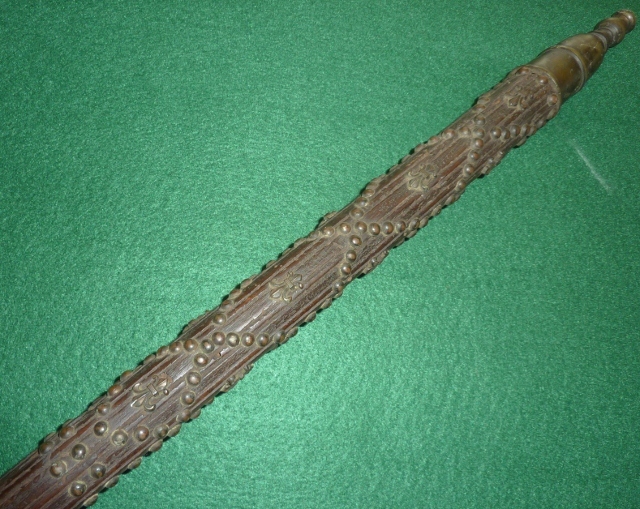 Blade marked crown over 3. Back strap marked with remnants of WOOLLEY. A choice 1796 Light Cavalry Officers Blue & Gilt Sword true to pattern with an excellent wire bound grip. Very good Blue and Gilt remains but has worn off in places due to constant withdrawal from scabbard.. Complete with early bullion sword knot. Excellent steel scabbard with only the smallest of minor dings. A slightly heavier 1796 Blue & Gilt Officers Light Cavalry Sword. 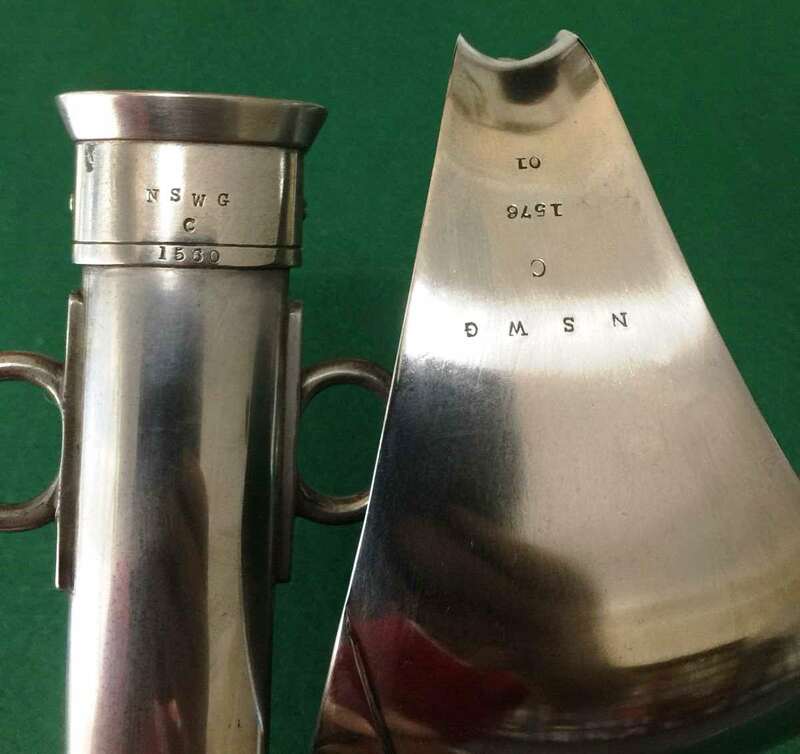 True to pattern with excellent steel scabbard maker marked Durs Egg Haymarket London in cartouche (1788-1804). A extremely good wire bound hilt. Blue & Gilt showing withdrawal from scabbard marks and wear. 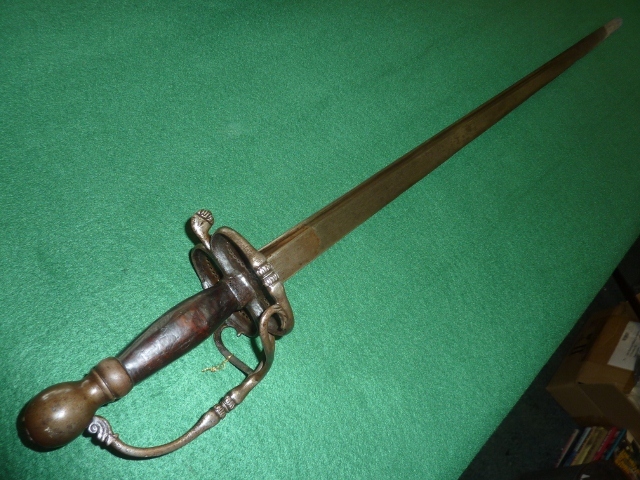 1908 Pattern Trooper’s Cavalry Sword marked to the 7th Dragoon Guards, the 88 cm straight blade with single fuller marked at the forte with the broad arrow EFD crown over 36 over E and various other markings, the plated scabbard marked M 11.13 and 7/DG 232, complete with brown leather sword knot, the hand grip of chequered composition, Matching hilt and scabbard numbers . A very rare Elcho bayonet by Gustav Felix. True to pattern but missing bottom scabbard mount and spring catch. Probably the rarest of all British bayonets, this honest example is the first I have had in 40 years. 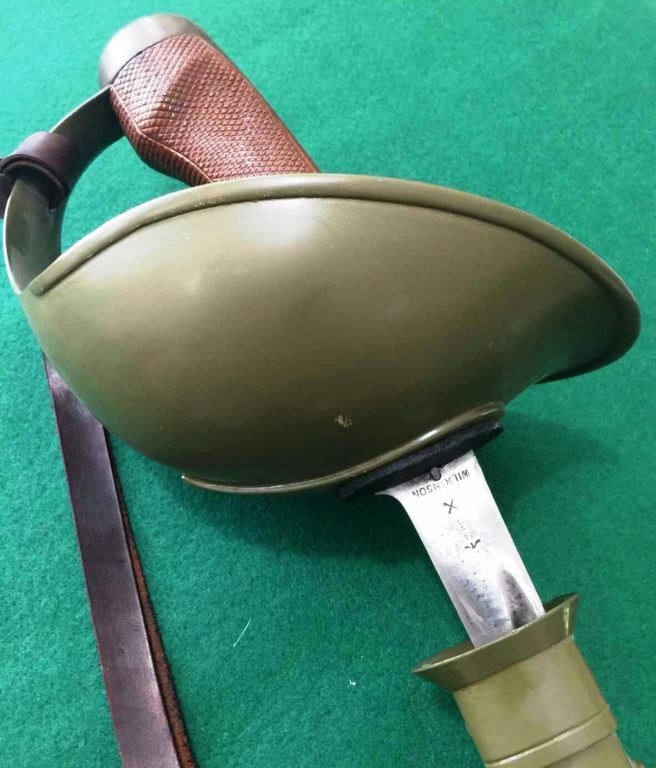 Interestingly the largest bayonet collector I know’ s examples all have the bottom scabbard mount missing. 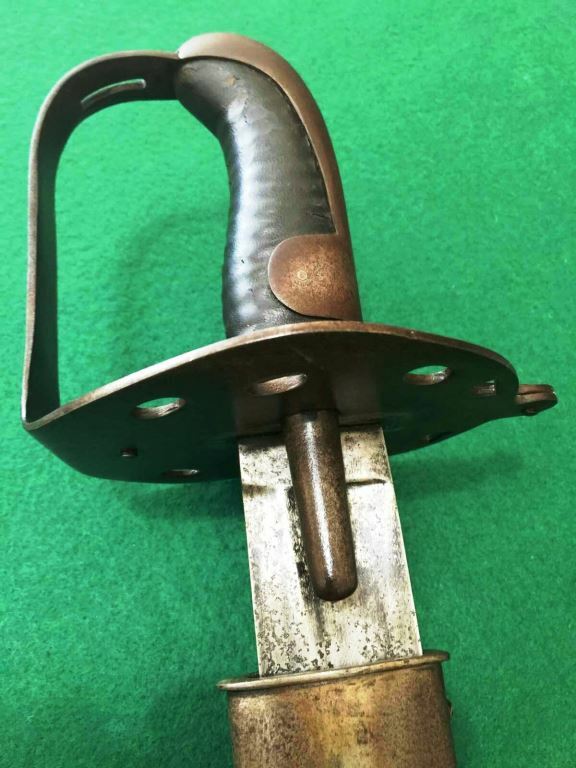 A very rare 1796 Heavy Cavalry Troopers Sword. 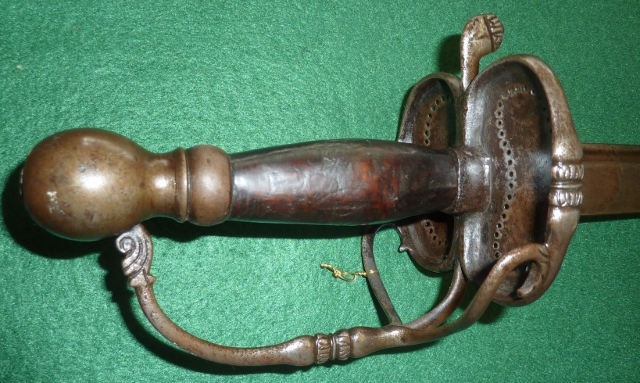 Often referred to as the “DISC HILT”. This one is very true to pattern still having its langets and full disc hilt. It also has the hatchet point making it as complete a representative you could hope to find. The back of the blade and disc are marked with a capital R with underscored D (Registered?). Pure speculation on my part but could this make it one of the first made during the period of registering original designs? There are two chop marks in the blade which have been nicely welded and are visible in the photo. The heavy dent free scabbard is unmarked. This pattern sword is very rare and difficult to find. 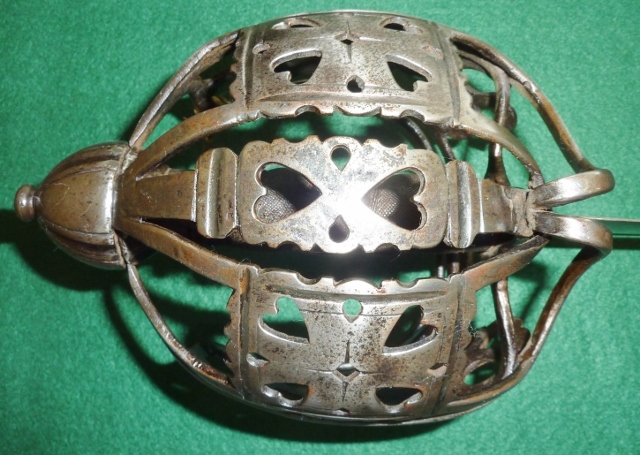 Another example of the 1796 Heavy Cavalry Disc Hilt sword. No real distinguishing marks to the sword other than a proof mark which I believe to be the crown over 4. The scabbard is stamped 8 over F41. The disc has not been cut down and both langets are present. The point of the blade has been converted from hatchet to point which some say could indicate Waterloo service. A very scarce 1853 British Cavalry trooper’s sword marked in the classic style for the state of Victoria. Complete with scabbard. 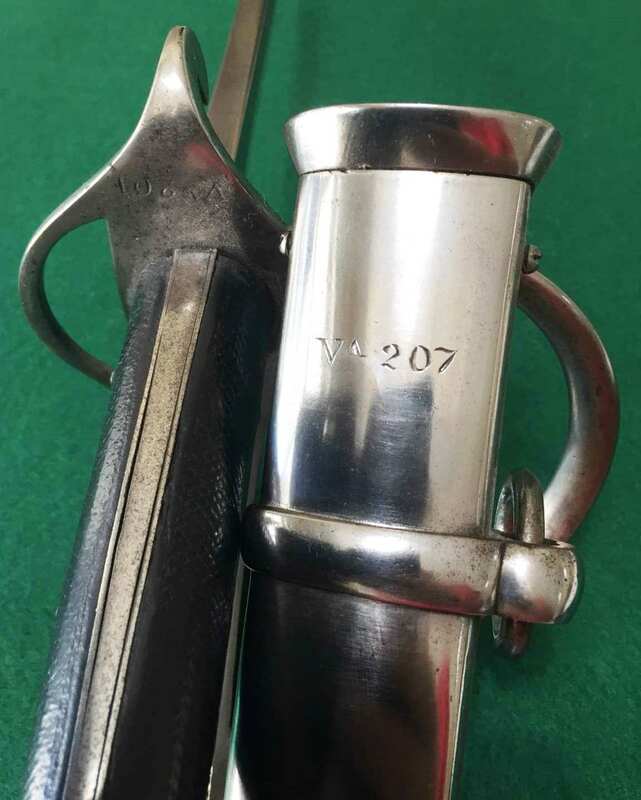 Hilt clearly marked Va 201 and the scabbard is Va 207.This pattern sword is believed to be the first edged weapon to be marked with Colonial markings in Australia. 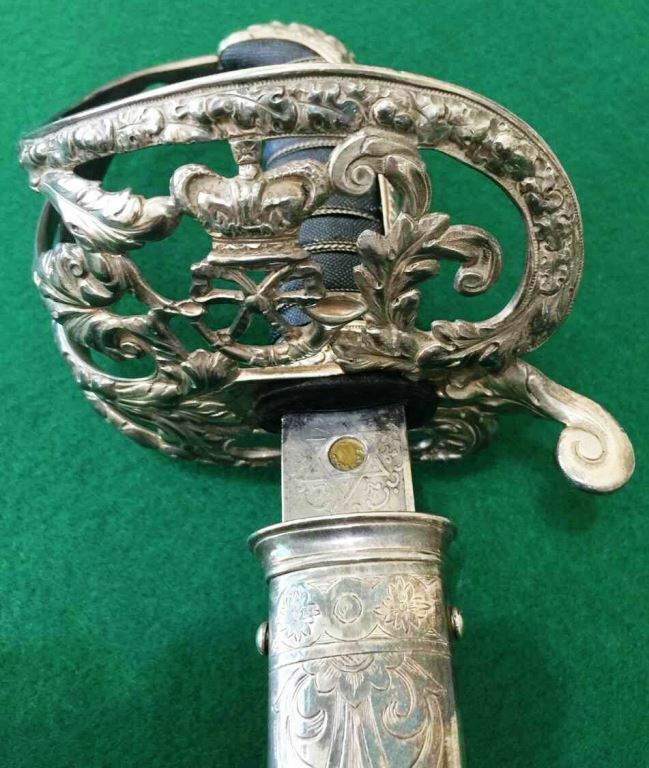 This is an extremely scarce sword and has been purchased from a very old established collection. A Scarce Colonial Australian sword being an 1882 pattern British cavalry trooper’s sword and scabbard well marked with impressed numbers and letters N.S.W.G.C over C over 1256 over 00. The scabbard number is matching. Another scarce item from this old established collection. 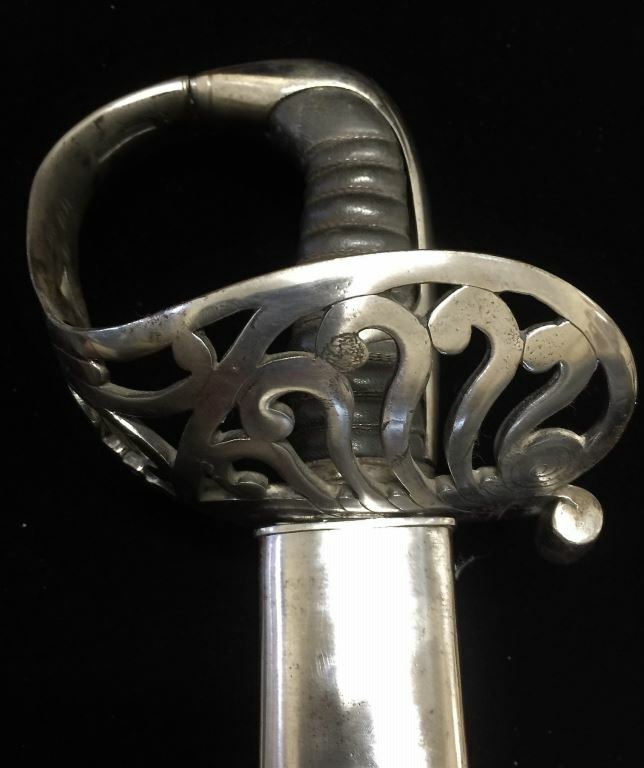 Another scarce Colonial marked sword of the 1899 pattern British cavalry trooper’s sword and scabbard well marked with impressed N.S.W.G.C over C over 1576 over 01 with the scabbard number 1560. Also from the same old established collection. 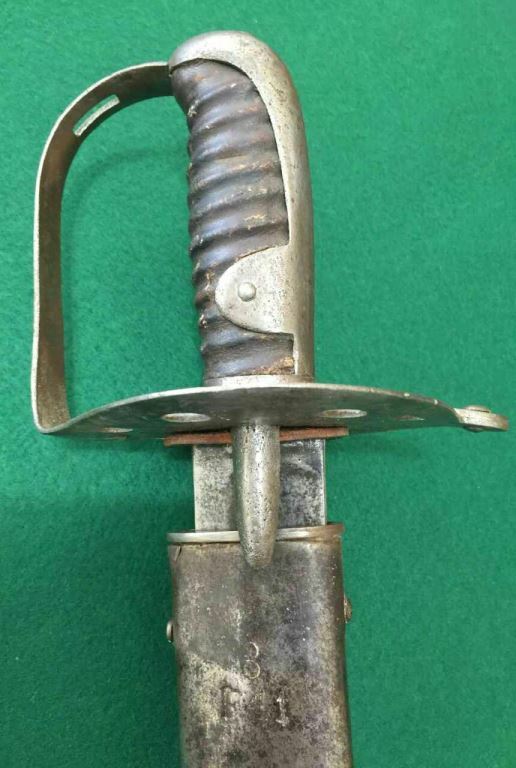 A very rare South Australian Officers 1822 pattern sword complete with scabbard by Wilkinson. 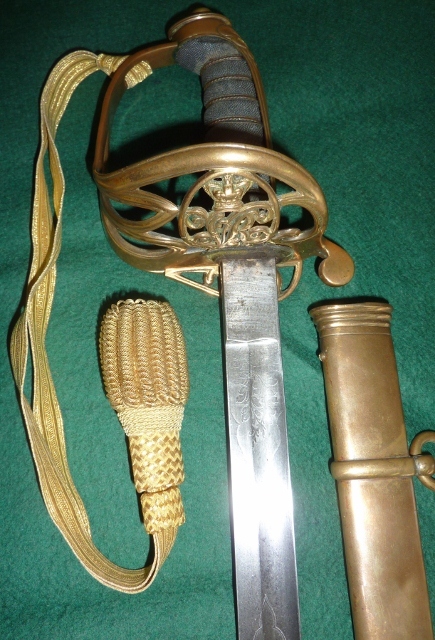 Typical brass hilt with VR cypher in its steel scabbard. 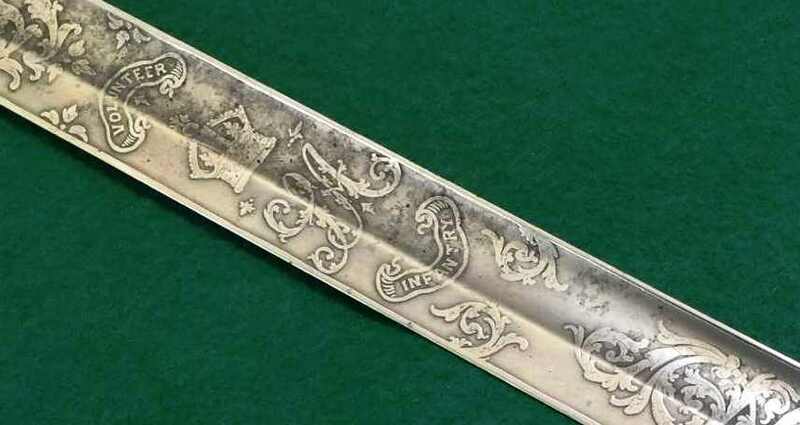 Quality etching to blade with Volunteer Infantry and SA (South Australia) under crown. Wilkinson’s records show this sword number 27838 was sold to the Agent General for South Australia Jan 25 1887. Note: Sold with a considerable amount of research concerning Sutton’s career. In brief he was a self-made man being called to the Bar in January 1876 and was promoted to Lieut. Col. in 1876 but resigned his commission in 1879 although only 36 yrs old. This was possibly due to what was then considered a disgrace being in debt regarding a mortgage. 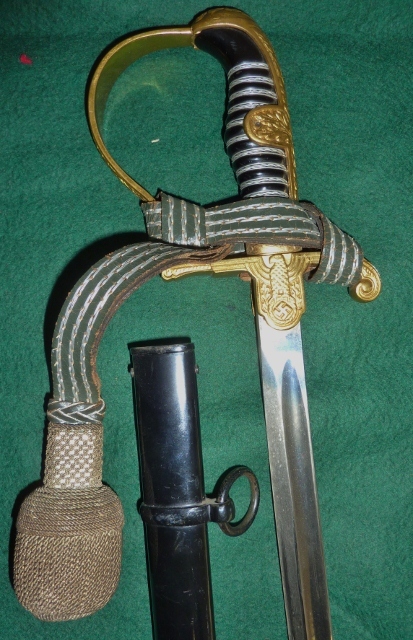 A 1908 Pattern Cavalry trooper’s sword by Wilkinson. Often referred to as the LIGHT HORSE SWORD as they were issued to our Light Horse in 1918. Marked on back of blade 08 and dated 1916. True to pattern and complete with straight undented scabbard which makes for a nice change. Very good quality checked grip without the normal lumps missing. Sword repainted is well done. On both the scabbard and the hilt is the large D with a broad arrow inside, making this an Australian issue. A French PARTIZAN circa 1700. Believed to be from the town of Lyon with its coat of arms being three Fleur-de-lis over a rampant lion with pretruding tongue beside what is possibly a rack number "164" (see photo). Very typical of style with toggle at right angle to spear face. What is particularly pleasing is that the fluted haft is original with many studs and Fleur-de-lis (a couple missing) at both the top and bottom. Haft has a small amount of old wood worm holes, however given how few retain original wood, this is a small price to pay. Overall legth 77.25 inches. 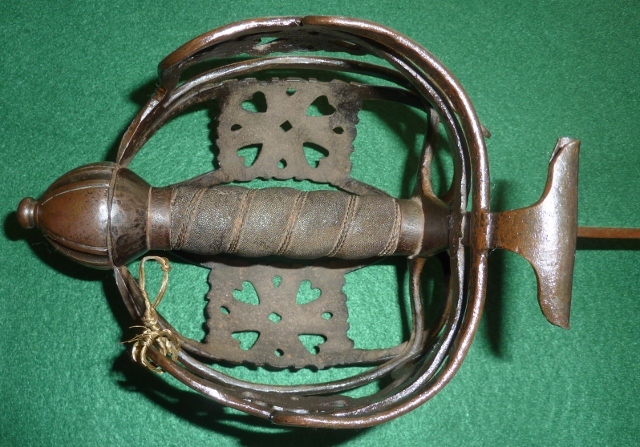 Scottish Basket Hilt Backsword Circa 1730, true to to style with very good wire bound fishskin grip. Blade Length 33.5 inches. 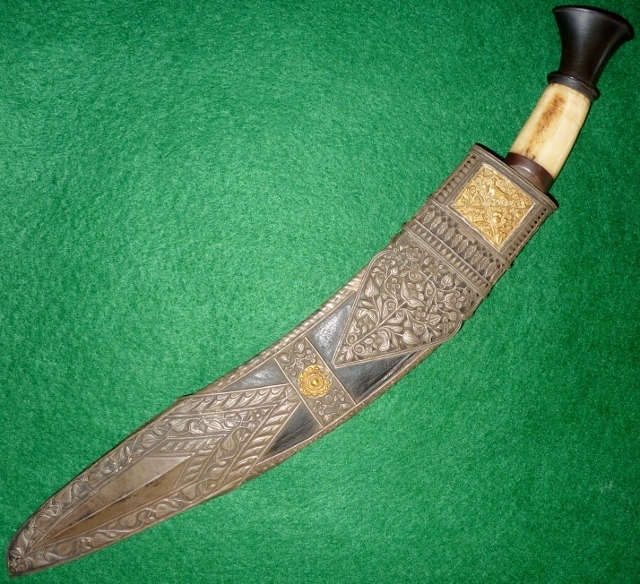 Kukri of the Kothimoda type. Circa 1850. Bone handle and clean blade mounted in a superb worked scabbard. Close examination of this silver scabbard shows quality workmanship and design with gold plaque and rose overlay. These special knives were used by senior ranking Gurkhas and are of the highest rarity. When one considers the price of gold and silver today, I believe it is very reasonably priced. 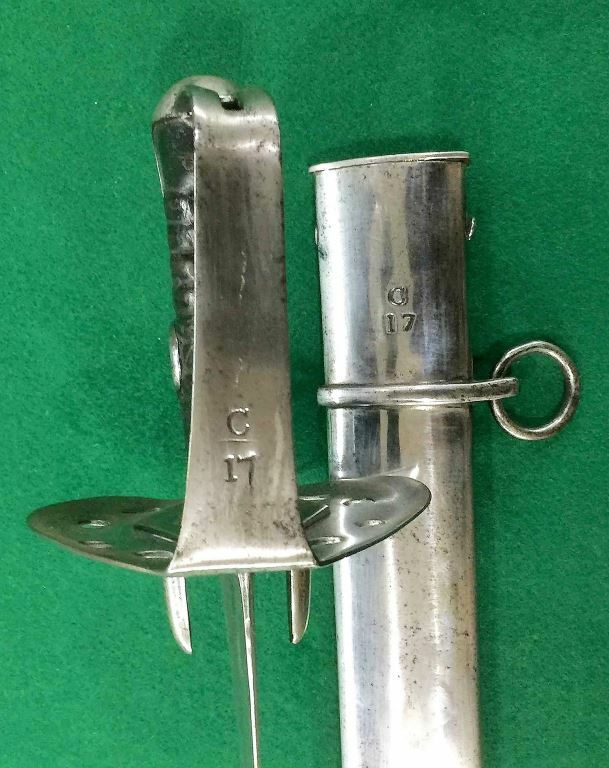 1822 Pattern Infantry Officers Sword. Blade by H. Hart, Pall Mall, London etched with the crowned "VR" cypher and scrolling foliate panels, standard gilt brass gothic hilt incorporating the crowned "VR" cypher, wire bound fish skin grip in its field rank brass scabbard, complete with a continental gold lace and bullion sword knot. 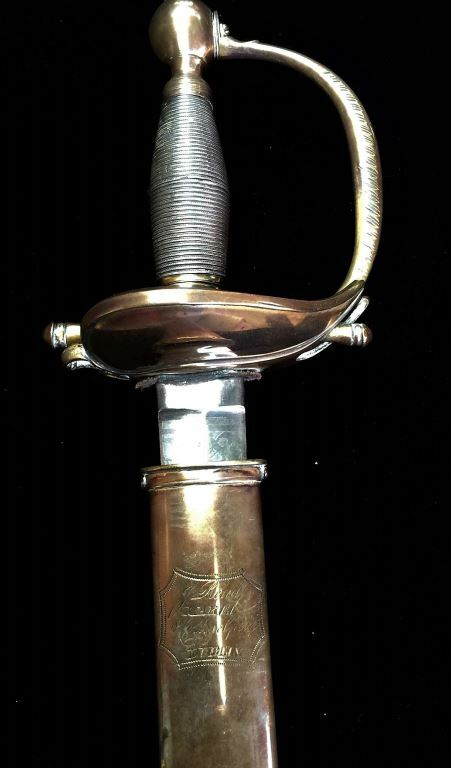 1831 Pattern General Officers Mameluke Hilted Sabre. 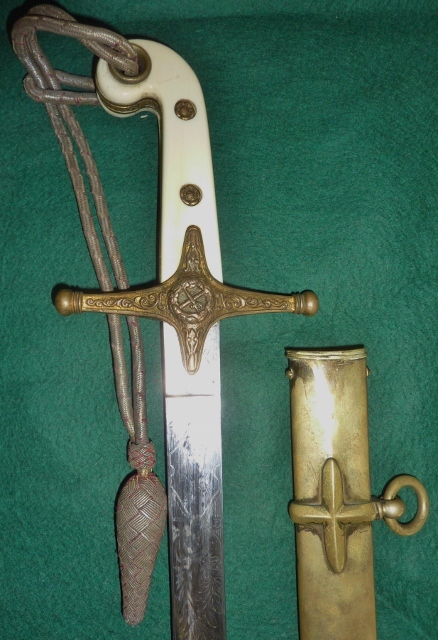 A Victorian period example, unfullered blade with clip and pipe back point by Thurkle of Soho London etched with crowned "VR" cypher crossed sword and baton crossed laurel and palm sprays and other scrolling foliage, brass mounted hilt with crossguard, this with foliate ecussian incorporating crossed sword and baton within laurels, two piece ivory grip in its brass scabbard complete with gold and crimson lace sword knot, the blade retains the majority of original polish. "For the best man-at-arms in the Bombay army"
"Given by Col. Fraser. V.C. 11th Hussars"
"Won by Sergeant Hurst 11th Hussars"
"Presented by Lt. General Sir Robert Napier K.C.B Commder in Chief"
Complete with scabbard and sword knot. 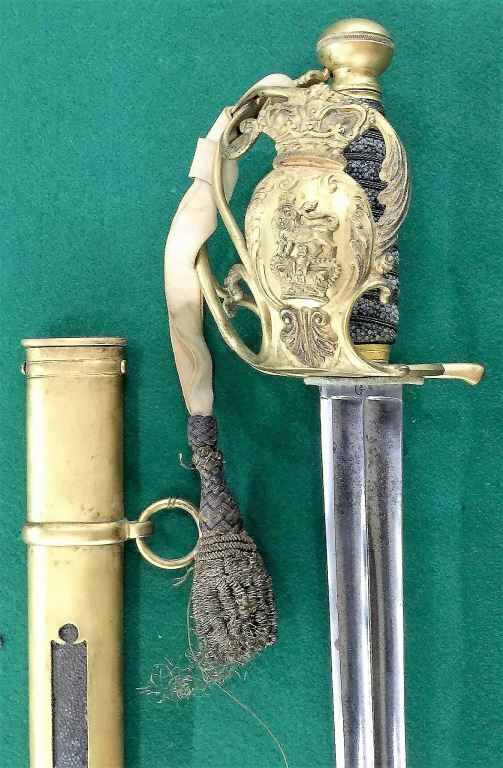 This sword is of the highest rarity to a famous British Cavalry unit, given by a Victoria Cross winner during the recipients service in India. WW2 German Army Officers sword by Carl Eickhorn. 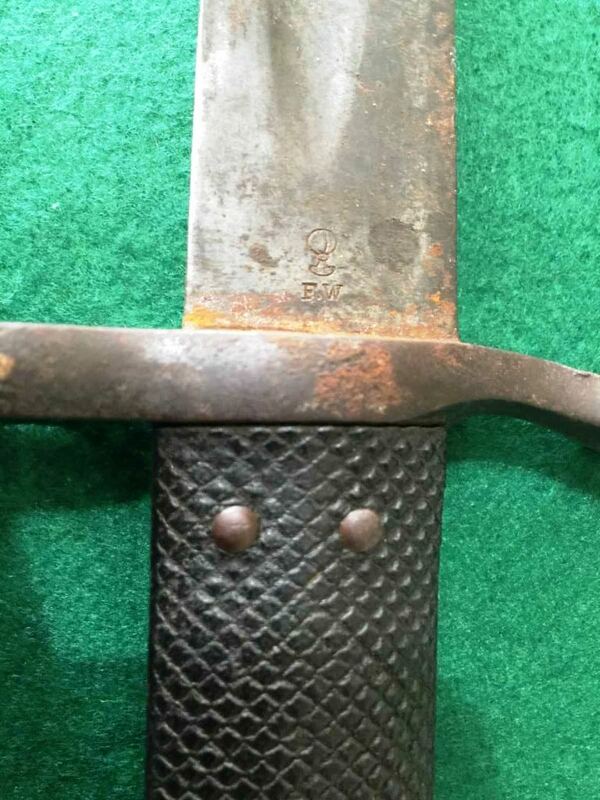 This sword is from the Eickhorn Field Marshall series and is designated the Wrangle pattern 1693. True to pattern in every respect with beautiful gilt hilt and perfect black scabbard. This is by far the best condition army sword we have ever handled.